Has anyone been able to access more than the first pages of those two articles? If not, I'll find those issues, scan both articles and post them at CCR. Won't be able to do so for maybe 3 weeks though. If you are referring to the Nastawgan articles, the "page" arrows at the top work for me: I can read the whole article through David's link. 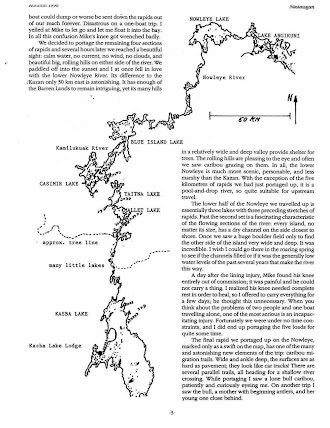 I think on that trip they left the Nowleye River quite soon - sort of opposite the 50 km scale marker on the map, went west to Blue Island / Casimir, and then south through a chain of lakes to Kasba. They didn't go up the Nowleye to near Ennadai, which is why (I guess) they did not include it in the sketch map. presented are 2 jpegs of area. one is google map (from nowleye l. to ennadai l.) and the other "hand drawn" i put in a a 50 kilometer reference on the google map so that it could be in relative correspondence with the hand drawn reference. 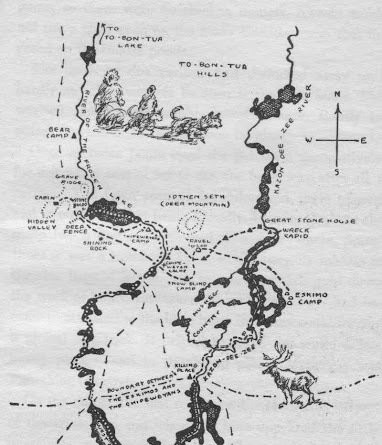 "I think on that trip they left the Nowleye River quite soon - sort of opposite the 50 km scale marker on the map, went west to Blue Island / Casimir, and then south through a chain of lakes to Kasba. They didn't go up the Nowleye to near Ennadai, which is why (I guess) they did not include it in the sketch map." could you map this please. 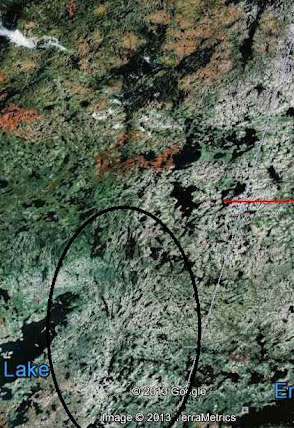 From Toporama or mytopo, the Kamilukuak River starts southwest of Three Wives Lake, then flows through Casimir Lake and Blue Island Lake to Kamilukuak Lake. A cursory inspection shows Taitna Lake (downstream of Mallett Lake) as emptying into Blue Island Lake, through lots of rapids. This was not Sara-Mike's route. 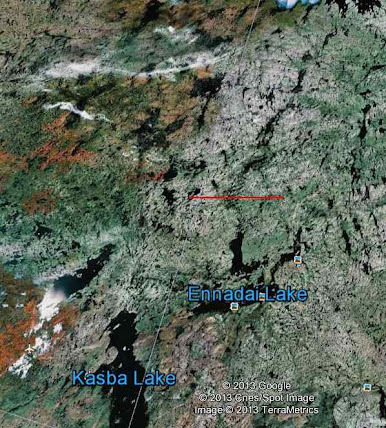 from Ennadai Lake, north and a bit west of Caribou Point? there is no exit between Nowleye and Ennadai Lake. We carried over from Ennadai Lake to the Nowleye headwaters. there may have been some seepage but no established stream. That red line on David's map is exactly what Toporama says is the Nowleye River. Nothing like ground-truthing to expose wishful thinking on part of the cartographer. Easy mistake to make though; please have a look with Google Earth. Just checked. 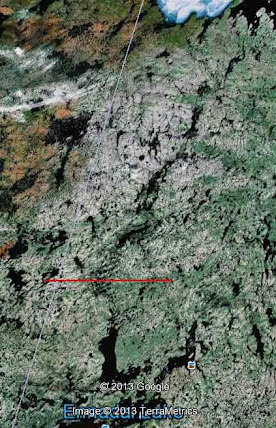 The old topo at mytopo shows a stream heading north from Ennadai Lake; that's the stream labelled Nowleye River now at Toporama. My guess: The error (an easy one to make if you look at Google Earth and so likely an easy one to make from the aerial photographs made long ago) was made in drawing the old topo (by hand! 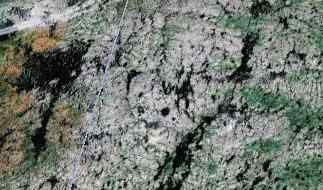 Look up Photogrammetry); it was carried over to the Toporama maps. Thanks once more to David for reporting in detail his ground explorations of this area, for example also the Dubawnt-Kazan land bridge. 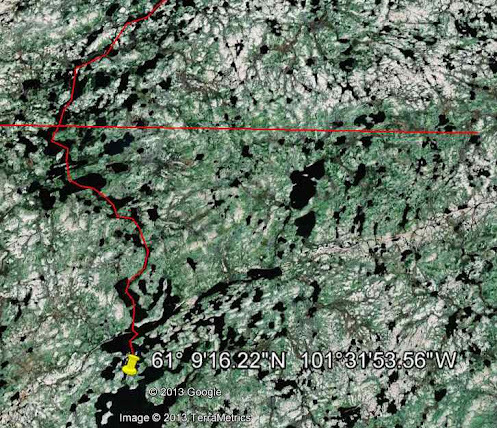 Another thread that brings back memories - from years ago on another solo trip from Black Lake to Eskimo Point - via Kasba Lake (resupply there) to Nowleye 0 Angikuni Lake and south to Henik Lakes and the Theanne River to Hudson Bay. The tidal flats north to Eskimo were miserable. That summer I was using a solo Swift canoe and a kayak paddle (like Herb Pohl ) - the only trip I did that. Went back to my larger prospector and canoe paddle. There are tons of experience and joys throughout the north - and waiting for the younger paddlers. I do think my paddling days in the north are over. David Demello - I will encourage Aleks Gusev (who is now organizing it) to try and coax you to come to next WCS here in Toronto next year. Too bad we never got together on a trip together. G.L. : "David Demello - I will encourage Aleks Gusev (who is now organizing it) to try and coax you to come to next WCS here in Toronto next year. Too bad we never got together on a trip together." George, i am pretty damn ugly up close and over a period of time i am unbearable. i remember one time on a solo i almost punched myself cold in a fit over some trivial nonsense. i am simply unpleasant in disposition and too easily moved to confrontation. your kindness is appreciated. Regardless, we still love you David! I know I've mentioned it before, you should be writing a book. If you have no interest, then maybe someone would like to write about your travels. .... George, i am pretty damn ugly up close and over a period of time i am unbearable. i remember one time on a solo i almost punched myself cold in a fit over some trivial nonsense. i am simply unpleasant in disposition and too easily moved to confrontation. your kindness is appreciated. Speaking for myself - I always prefer honesty and frankness over false politeness. David - you can't be as bad as you describe - otherwise no sensible spouse would stay with you - like yours does - and mine does also. Thanks everyone for your information. David thanks for pointing out that the maps are wrong for showing the river beginning at Ennadai, but instead begins with a portage. Not really an issue but my paddling partner has a potential or likely schedule conflict so the trip is up in the air at this point. I could go solo, look for a partner, or maybe head way south and save a few bucks on flight costs. We'll see what develops. from Mowat's "Lost in the Barrens"